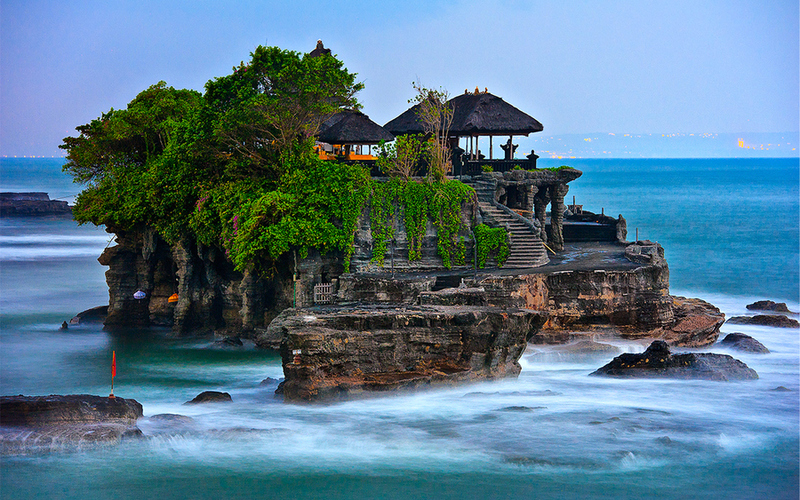 Tanah Lot Temple is located on the beach side Beraban countryside , Kediri sub district and Tabanan Regency . Tourist Places in Bali is situated in 30 Km in west side of Denpasar town and about 11 Km to the south of the town of Tabanan . The temple is built on the rock with 3 acre size and can be reached within a few minutes by foot , because it is only 20 meters from the beach . This temple is very famous among tourist destinations in Bali in having a spectacular view and a very fitting place to enjoy the sunset . In some corners of the coral reef around Tanah Lot Temple there are holy tame snake in black and white where, according to local people believed that the deity property and as the guard of the temple from the bad influence . As a tourist in Bali , Tanah Lot has views especially at sunset where the sun slows down to the bowels of the earth . Every visitor who pays a visit to this place will be amazed to see the beauty panorama of Tanah Lot . Besides this temple , there are other temples which can be seen on your visit to Tanah Lot like Batu Bolong , temples and temple Enjung Batumejan Galuh .